THE BABY OF THE FAMILY. 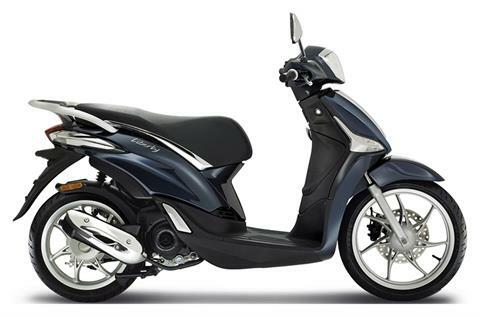 The Piaggio Liberty 50 is generally considered the entry level model in the Liberty family which also includes 150 cc versions. Available also in a sportier version, the S, it has long been known and beloved for its elegance, lightness and smart use of technology. Powered by a single cylinder 50 cc engine which uses i-get (Italian Green Experience Technology) ) with a three-valve timing system it offers impeccable performance and reliability as well as reduced fuel consumption. Scrupulous attention has also been afforded to the construction of the body and finishes to ensure maximum safety and thebest possible driving experience, with the wide wheels (14” at the rear and 16” up front) delivering greater precision and manoeuvring. Last but not least there are the practical aspects such as the spacious under seat compartment which can hold a full-face helmet, the rear shield storage box and the instrument cluster instrument cluster analog and digital elements to ensure maximum visibility no matter what the light conditions. EVERYTHING WITHIN EASY REACH: The handy storage compartment in the rear shield of the Piaggio Liberty 50 is divided into two parts and also includes the option to install a USB socket so you can recharge your phone while you’re on the go. Under the seat, which you can open with the simple press of a button, you’ll find another spacious compartment able to hold a full-face helmet. Transporting bags and shopping isn’t a problem as you also have a bag hook and space on the flat footwell. ALMOST A MAXI BENEATH THE PLASTIC: The main frame of the Piaggio Liberty 50 is a sturdy single cradle in steel tubing with pressed steel plates to help ensure driving stability. Front suspension is a 76-stroke telescopic hydraulic fork with a hydraulic shock absorber in the rear, and the wheels come in at a grand 14” and 16” diameter. DISTINCTIVE STYLE: The elegant layout of the instrument cluster seamlessly mixes analog and digital technology. The classic gauge with an arrow sits alongside a modern LCD display which can be read by clicking a button located on the right hand of the handlebar. The wide front shield means increased protection from rain and provides the perfect backdrop to the classic Piaggio vertical design and side indicators.